What is meant by "Free Trade Zone"? The term "Free Trade Zone" in Singapore refers to the designated area where the payment of duties and taxes are suspended when goods arrive in Singapore. It benefits all traders as Goods & Service Tax (GST) will not be charged, making it easier for financial portfolio diversification. What is the Customer Agreement? 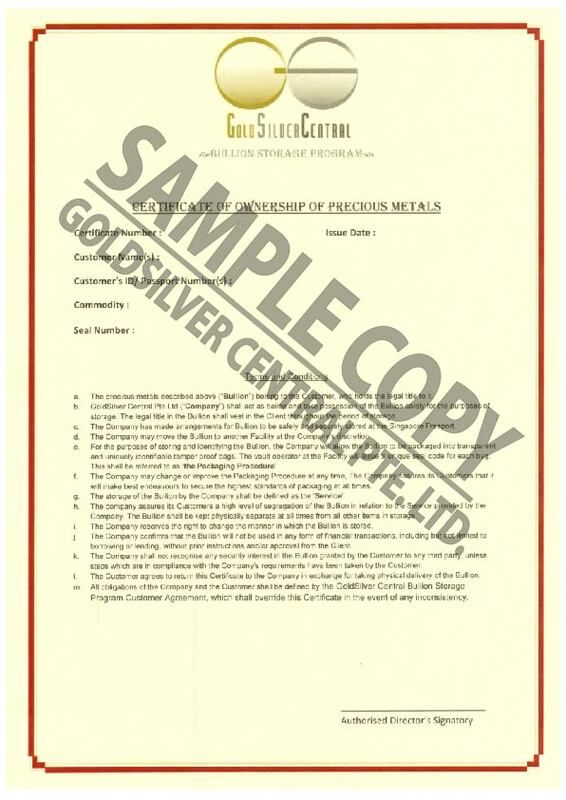 The "Customer Agreement" is a contract between our client and GoldSilver Central. The contract assures that the bullion purchased will be allocated and stored securely on our client's behalf. The bullion will be recognized as our client's property at all times, with GoldSilver Central acting as their custodian. How many parties are entitled to Account Ownership? A maximum of two parties can be named owners of the account. Both parties will be authorized to release the bullion for the purposes of withdrawal and final delivery. What is the "Certificate of Ownership"? The "Certificate of Ownership" indicates that the bullion has exclusive allocation and is recognizable by a sole unit referenced with GSC. The certificate will indicate the Certificate Number, Commodity (Serial Number of Bar, if any), Seal Bag Number and Issue Date. What documents/items are required to start an account? b. List of bullion that our client wishes to store with GoldSilver Central. What payment is required upon signing the "Customer Agreement"? There is no payment required upon signing the agreement with GoldSilver Central. An initial fee will only be charged once the customer stores the bullion. It covers the handling and transfer fees and storage fees for the first year. Can I store existing bullion that was previously purchased from GoldSilver Central or from other places? Yes, clients are able to store their existing bullion with GoldSilver Central. Please note that the purity and authenticity cannot be guaranteed if the bullion was not purchased from GoldSilver Central. Clients are required to bring along the proof of purchase for bullions not purchased from GoldSilver Central. Can you assist with the logistics if I would like to bring my existing bullion stored overseas to your storage facility in the Singapore Freeport? Yes. Clients are required to furnish GoldSilver Central with detailed information of the existing bullion. Please take note that there will be a separate charge for the logistic arrangements. Is there Insurance Coverage for the bullion? Yes. There is full coverage on the precious metals stored with GoldSilver Central in the Freeport by Lloyd's London up to US 1,60,000,000. Is there a minimum period for bullion storage? Is there GST charged for the storage service? No, there is no minimum period. Please note that there will be no GST charged on the total value of the bullion. When is the storage renewed? A month prior to the next payment's due date, clients will receive a reminder to renew the account. Fees can be paid to GoldSilver Central via cash, bank transfer, credit card or cheque. Example of Calculation of Storage Charges Storage period from 06/03/2016 to 15/10/2016 will be considered as 8 months storage. S$ 343.54 (inclusive of GST) Storage period from 06/03/2016 to 15/10/2016 will be considered as 8 months storage. S$ 258.94 (inclusive of GST) Please refer to example given for Gold Storage. Please note that storage charges will be charged annually in advance, and will be pro-rated depending on the month the client decides to take final delivery. Charges are based on a monthly basis regardless of the day the storage starts. The annual storage charges have to be made together with the bullion when contracted. As for the renewal of annual storage charges, payment has to be made within 1 month before the previous annual storage charges end. What does "sealed bullion" on your website mean? 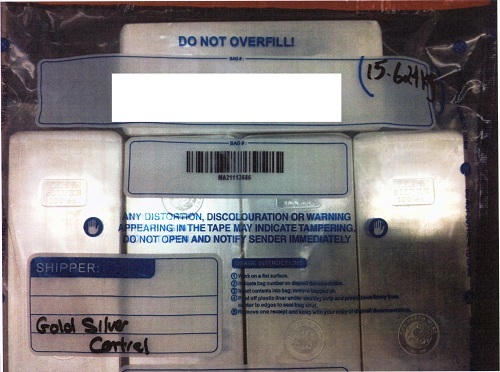 For the purposes of bullion storage and identification, the bullion will be packaged into transparent and uniquely identifiable tamper proof bags. The vault operator at the facility will issue a unique seal number for each bag, in which its final package is known as sealed allocated bullion. Will we receive any updates regarding our stored bullion? Yes. Clients will receive monthly updates from GoldSilver Central via email on the inventory status of their stored bullion. Additionally, an audit of the bullion is conducted annually as a value-added service. How is the transfer of ownership conducted? Upon the client's notification, GoldSilver Central will require both clients (current and new) to head to the office for the processing and confirmation of the transfer of ownership. Alternatively, the transfer of ownership can be conducted via email with the completion of the "Transfer of Ownership" form and a scanned copy of the individual's identification card/passport. Please note that if the new client is a foreigner, a proof of address is required. There are no charges for the transfer of ownership. Are there any charges if the bullion is released or withdrawn? A release fee (S$ 100.00) is chargeable with each bullion transfer regardless of its weight. The release fee covers the administrative work for permits and clearance.There are no charges for the transfer of ownership. If I would like to personally inspect my bullion, what is the procedure and what should I be aware of? For an inspection or facility visit, an appointment with GoldSilver Central must be made 14 days in advance prior to the intended visitation date. Each visit is subjected to a fee of S$ 80.00 and only a maximum of 4 persons are allowed. All guests are required to adhere to all rules and regulations set by the facility. How is the withdrawal of the stored bullion conducted? An advance notice of 2 days and the client's endorsed release form has to be submitted. This release form authorizes GoldSilver Central to withdraw the bullion from Malca-Amit. All expenses incurred by GoldSilver Central during the course of the agreement must be paid prior to receiving the "Final Delivery", including payment of the "Release Fee" (S$ 100.00). Additionally, the "Certificate of Ownership" has to be returned to GoldSilver Central before the bullion release. It will be deemed as a formal acknowledgement that the client has received the bullion.